This chapter introduces a way for enhancing teaching history of mathematics through digital storytelling. Adapting digitals stories in the form of historical documentaries, this chapter also provides components of digital storytelling (point of view, dramatic question, emotional content, the gift of your voice, the power of the soundtrack, economy, pacing, purpose of story, choice of content, quality of images, grammar and language usage) and necessary steps (tellable story, compositing script, choosing visual and audio components, preparing digital stories, presenting digitals stories) that are to be taken into consideration while preparing digital stories. Nowadays, technology has surrounded our lives such a way that we become overly dependent on it because of its priceless benefits. This close relationship between (modern) technology and humanity also affected the way of learning and teaching. In turn, the term “technology enhanced learning” becomes evident in recent literature in education. 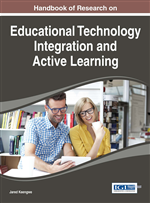 Technology enhanced learning covers all those circumstances where technology plays a significant role in making learning more effective, efficient or enjoyable (Goodyear, & Retalis, 2010). Moreover, literature provides several models of technology integration of educational environments that include accessing and studying learning material, learning through inquiry, learning through construction, learning through communication and collaboration, assessing learning, and developing digital and multimedia literacy (Bruce, &Levin 1997; Chickering, & Ehrmann, 1996; Conole, Dyke, Oliver, & Seale, 2004; Jonassen, 2008). Digital Storytelling: Technique that stories are narrated and enhanced through multimedia devices and passed on to audiences. Educational Technology: The term of educational technology generally refers to the introduction of computers and related pieces of equipment to the classroom. History of Mathematics: The area of study is primarily an investigation into the origin of discoveries in mathematics and, to a lesser extent, an investigation into the mathematical methods and notation of the past ( http://en.wikipedia.org/wiki/History_of_mathematics ).